Four-year-old Winter has a thick fringe and long hair that reaches halfway down his back, and it is going to keep growing. “He has the kind of hair that people come into the salon and pay 300 or 400 dollars for,” says his mother, Alice Goulding. “I know because do it at work everyday. Light blonde on the end blended up to a dark blonde on the roots. He’s got a natural balayage and it’s so natural and it’s so beautiful it’s so perfect so why cut it? It’s so nice,” she said. Winter’s mother is a hairdresser but has never cut her son’s hair. “I’ve only ever cut the fringe,” she said. "I am so past caring what people think." Image supplied. 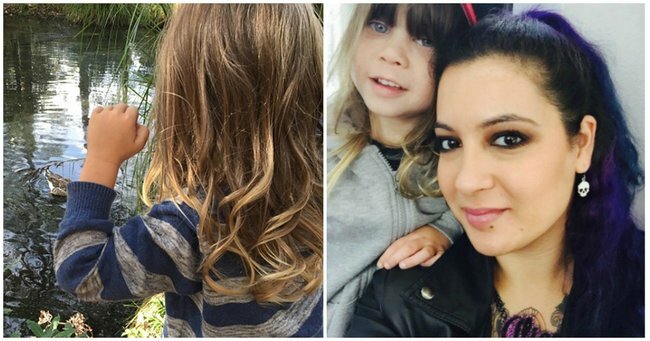 The 29-year-old mother gets a lot of uninvited advice about her son&apos;s long hair. "Everyday, someone will say: &apos;You should cut his hair.&apos;"
"I am so past caring what other people think of what I do. People will always criticise," she says. "People always say why you doing this or that – he’s a little boy and he may grow up and get a job where he has to look a particular way for work, so while he is young and he can look how he wants and he can be a bit free then, why not?" The Sydney mother points out "cool" long haired men on the street, short haired women and superhero Thor to help her son understand that there is variety in life. "I’ve tried to bring him up to be like – be who you want to be," says Alice. "He’s quite open minded for his age." Winter could be described as a typical four-year-old boy - he&apos;s got an avid interest in trains, trucks and all things transport in a Lego kit. He dresses in superman and batman outfits and is "extremely adventurous" and outgoing. But he often gets mistaken for a girl. "All the time people just assume he’s a girl. Then he gets annoyed and says: &apos;I&apos;m a boy. I’m a boy.&apos; He stands up for himself, I don’t have to say anything," she said. However, some of the judging is just plain nasty. Recently, another mother told Alice that her son would have gender identity issues later in life because of his long hair. "Someone said to me at a kid’s party: &apos;He’s going to grow up to be trans because his hair’s long&apos;. I said: &apos;No one’s ever influenced to be trans, they either want to do it or they don’t..."
"I don’t think hair length is indicative of that. I am trying to teach him that hair length isn’t indicative of gender or anything." Winter and his mother, Alice. Image supplied. Despite being harassed everyday, the Sydney mother said she isn&apos;t planning on changing her son&apos;s unique hairstyle. "I have absolutely no desire to cut it. I’ll let it touch the floor. It’s just so nice."